The NDC Geekbeer has become a wonderful pre-conference tradition, where a lot of the initial socializing can be done. No different this year! Twitter profiles were personified and new acquaintances made. A wonderful evening that really got the social geek in me into overdrive. 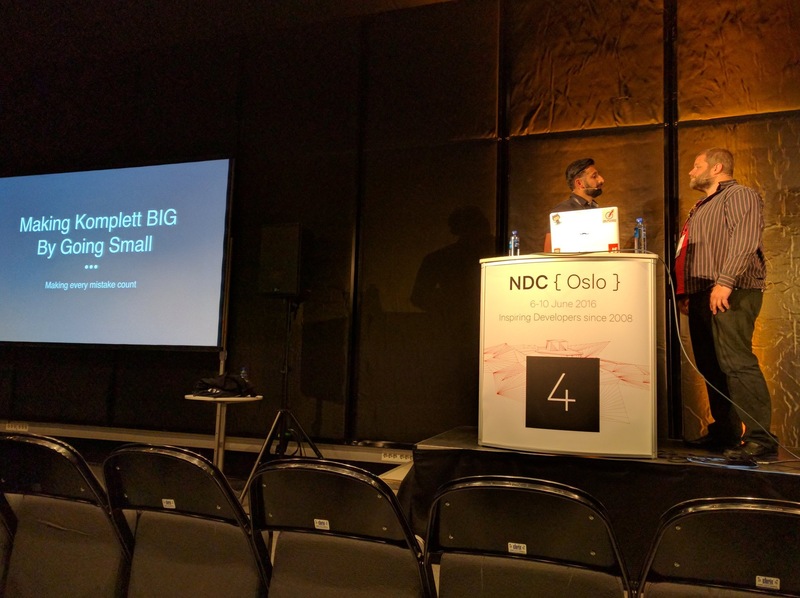 I had a couple of approaches to talks at NDC this year, either go to the talks I REALLY want to, or go for new things to expose myself to. I ended up following my heart and went for those talks that I felt were good for me. After Troy Hunt’s wonderful keynote, I started softly with Jeremy Clark’s talk on Becoming a Social Developer. I’m already a strong proponent of embracing the social side of software development, but I found some good value here. He has some great, practical tips for getting started as a social developer at a conference like this. Though I am quite social and open to begin with, I’m horrible at starting the conversation, which Jeremy emphasized and gave some concrete tips on. Don’t underestimate the soft skills. Watch this, when the videos are out. 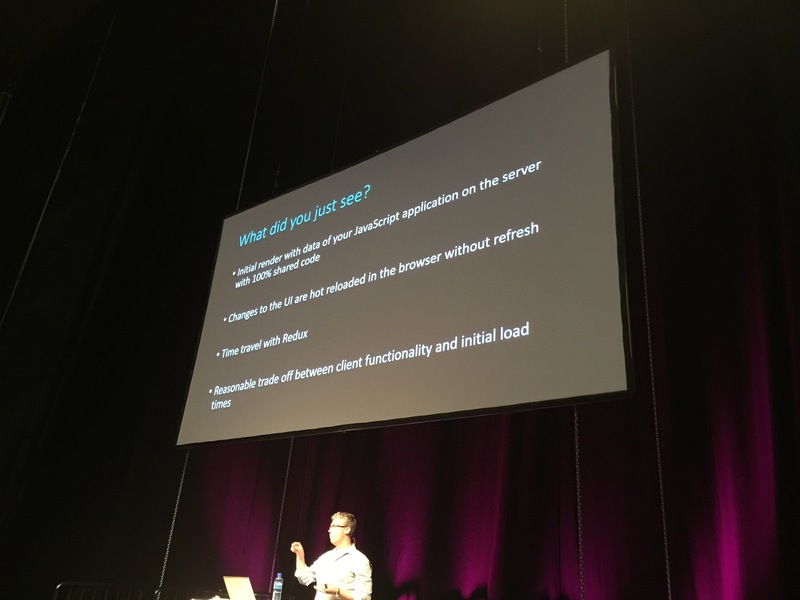 I dropped by Sebastien Lambla’s talk on how API versioning is evil and should be used as a last resort. This is already an approach we have at KomplettDev, but he had some nice experiences and examples he shared. I don’t find it very controversial, but there are certainly challenges. One of the key take-aways is how clients and server alike should always be open to accepting more data than it’s capable of reading. In other words, allowing to send way too much information, but just extracting whatever the api endpoint supports. A good notion that I’ll be taking a long with me. I decided to go functional and attended a functional workshop. I ended up sitting with Bryan Hunter and Robert Virding and talked about functional C#, as well as comparisons to F#, Erlang and Elixir. I was amazed at the knowledge and openness of everyone in the room. Such a great atmosphere, and wonderful people. I’ve got my first taste of functional. It won’t be my last. Jake Ginnivan summarizing his buzzword talk. A solid introduction to building the web with the latest flavour of awesomeness from React / Redux by Jake Ginnivan. I was blown away by two things: Component based CSS by referencing scss directly into .jsx files and “Time-traveling” in the browser with Redux Devtools. Recommended intro session to navigating the tooling around React / Redux. Denise Jacobs and Jessie Shternshus from the Speaking Coaching workshop. This session was so full of energy that I forgot to leave for the next session. 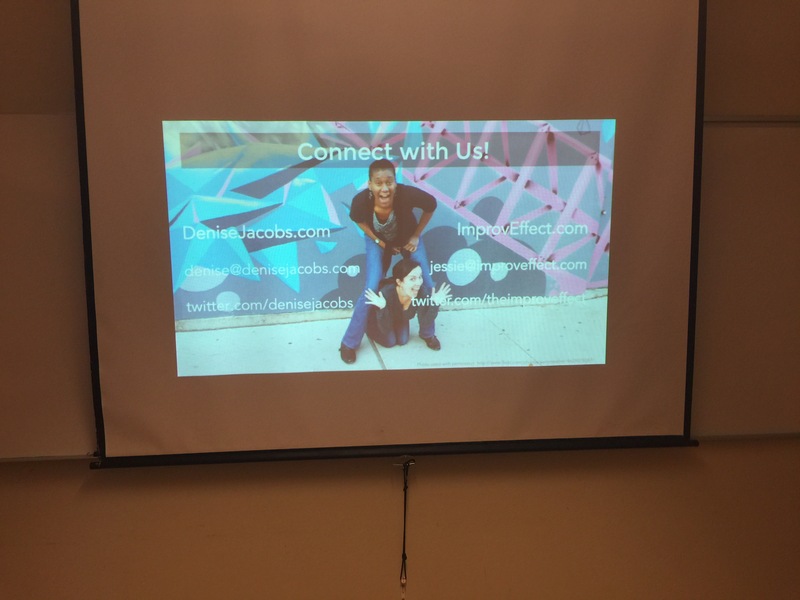 I did another workshop and met two wonderful people; Denise Jacobs and Jessie Shternshus. It was a wonderful experience of loosening up, getting in touch with my expressive self and learning to be deliberate with my communication. The most unnerving part was the improv. I knew this would be challenging, and pushed my own personal boundaries. Great preparation for my own session on Friday. I’ve been looking forward to this talk. 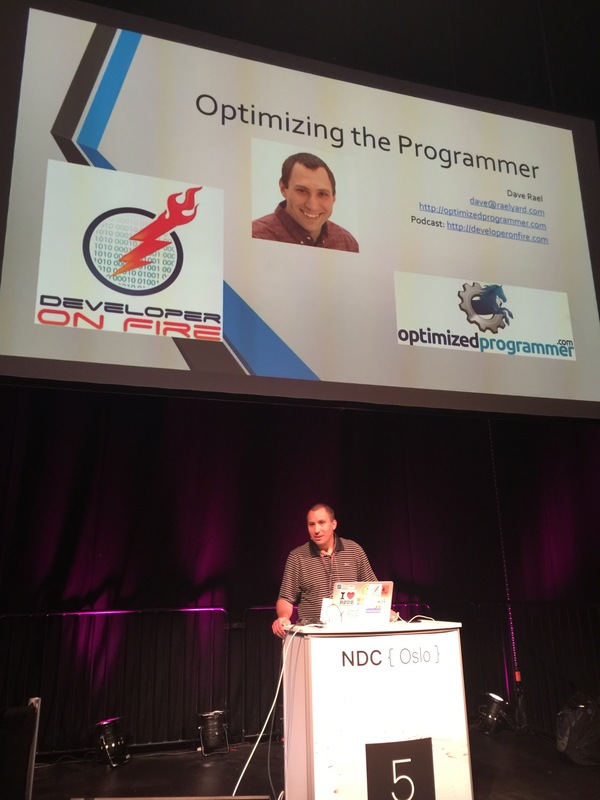 Not only is it an interesting topic, it’s also by someone I’ve connected with personally when he interviewed me for the Developer On Fire Podcast. I’m of course talking about Dave Rael. 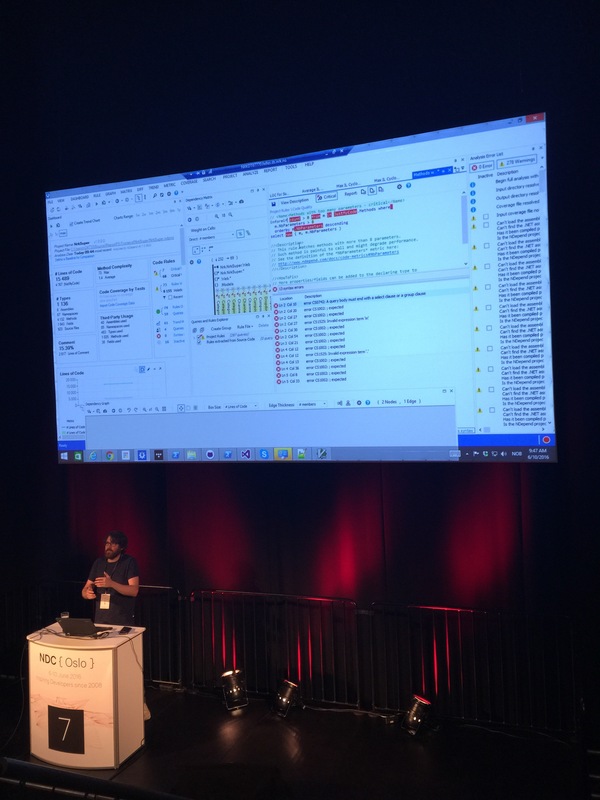 Dave has some interesting views on developer productivity and shares how he stays productive with email, automation, learning your tools and keep the hardware fit. Kylie Hunt’s intro with a steady heart beat that silenced the audience and got our attention. I almost didn’t go to this talk, but decided to in the last second, and I’m so happy I did. 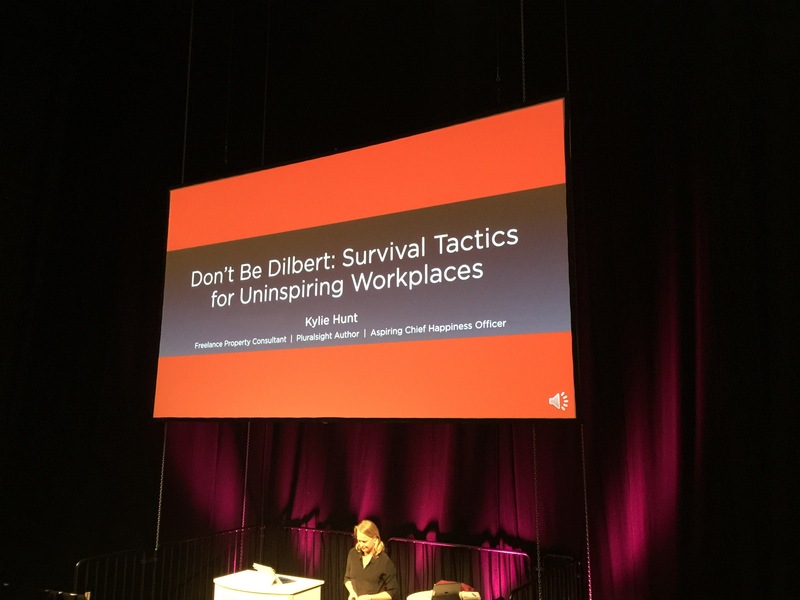 Kylie Hunt cut straight to the chase and talked about pursuing happiness at work. She shared her story of workplace unhappiness and her way out. She had a wonderful message of steps everyone can take improve their own workplace experience. You want developers producing their best? Remove roadblocks and focus on their happiness. Her message, points and delivery was spot on! It resonated with me in such a powerful way. I was reminded of my own experiences of “Smondays” barely a year ago, and my struggle to get to good place. I recommend this talk to everyone. It’s not developer-focused, but is essential for finding happiness where you are and helping those around you to achieve the same thing. Here’s Kylie’s own summary of her talk, with resources. I can’t wait for the video. I’m sitting here, laughing, smiling, teary-eyed. 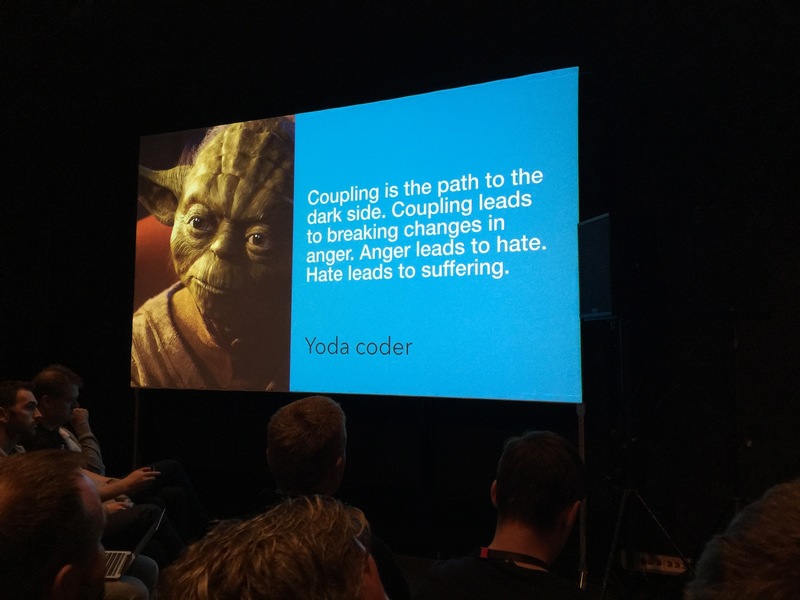 I was fortunate enough to attend Bjørn Einar Bjartnes‘ talk on Strategic Refactoring using static analysis before the nerves kicked in on Friday before our session. He showed how the team at the Norwegan Broadcasting Network are creating frontends for their online TV-portals. Some of the pains they’ve had and how they’ve used static code analysis to measure the impact their refactorings have made. Much of Thursday, and almost all of Friday went to last-minute preparations for my own talk with Tomas Ekeli. 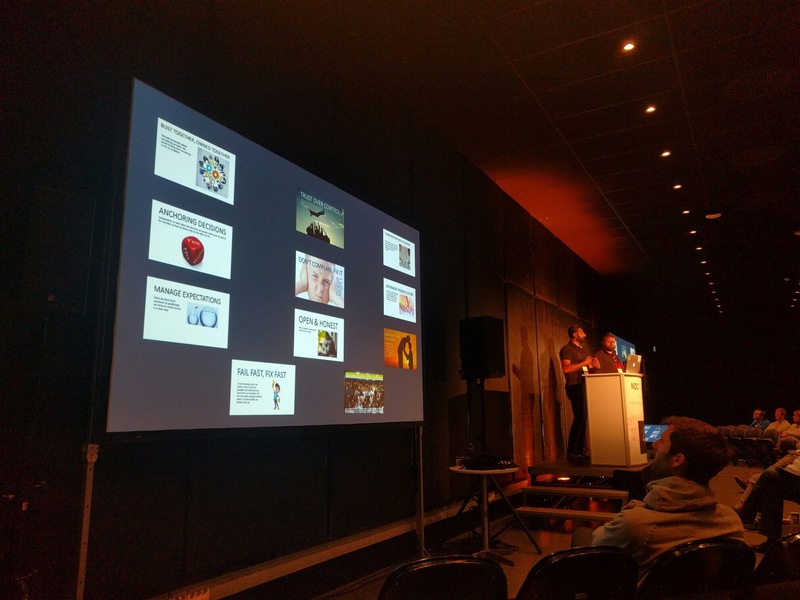 It sucked missing many talks, but the focus I (we) experienced was quite astonishing, and I decided to enjoy the experience of preparing for my own talk for the first time. The talk went quite smoothly and I think we got a decent crowd of approximately 60 people who listened to us and gave us some great feedback. There was even a great discussion afterwards. Final day picture with KomplettDevs Tomas Ekeli & Jessy Kyalo Musyimi. Also Mads Torgersen’s shadow made a graceful appearance. 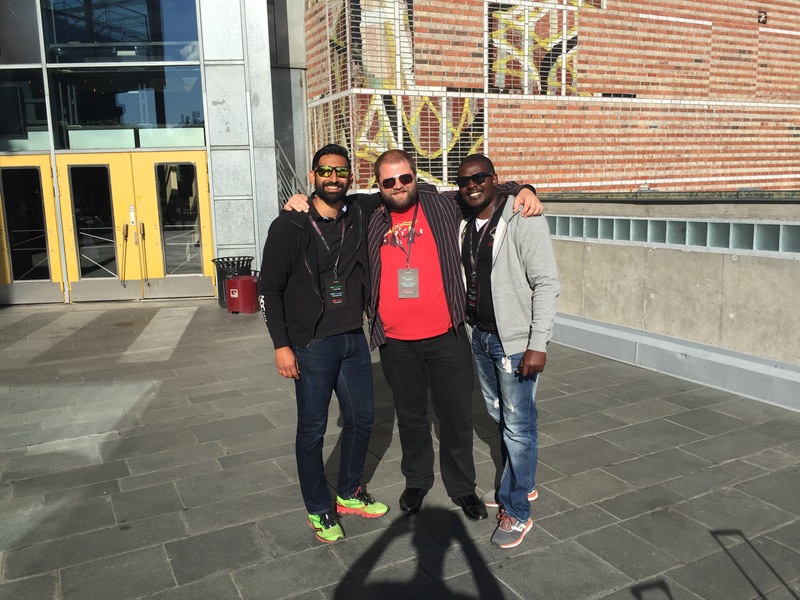 NDC Oslo 2016 was a great experience all-in-all. I’ve made many new connections, and have strengthened existing ones. The talks I’ve been to have been moving and inspiring. I followed my heart this time around and feel I’ve had a wonderful overall experience. I’ll be watching many of the technical talks when the videos are out and hopefully add some notes on those as we go.